Some of the best chefs say that simple, fresh ingredients are the way to go and that at times there is no need for fussing about with tons of different flavours. Makes sense, doesn’t it? Some of my favourite meals are ridiculously easy to make like this mouth-watering mozzarella and tomato sandwich! Paola whipped up this scrumptious bite the other day as it reminded her of her time in Florence, Italy. I love that and from now on each time I eat this sandwich I'll be day-dreaming about Italy in the summer or those long mornings Balazs and I shared in Venice. So, what do you need for the perfect mix? 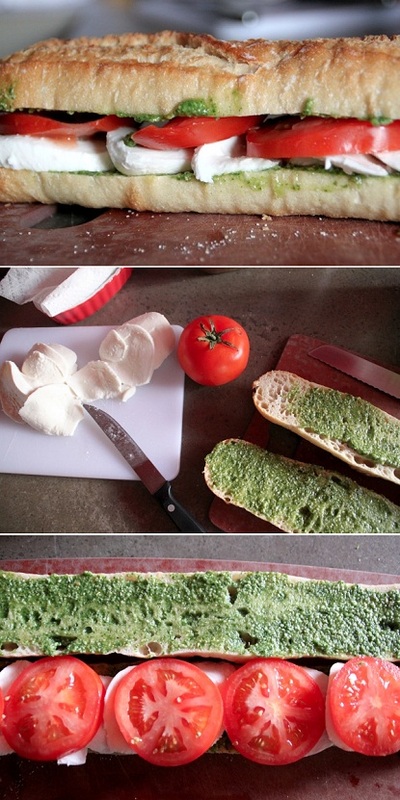 A fresh baguette or a piece of focaccia, homemade pesto (or store bought - my favourite), juicy tomatoes and mozzarella. Voilá! Oh, wow, that looks delicious! I love anything involving the word "caprese" so I might be biased :) I definitely think of the place I first experienced a dish when I make a recipe at home and think of my grandma or mom when I make one of their dishes. It makes the food even more enjoyable! Oh yeah mine too. This is my go to sandwich. The key is a good piece of baguette and definitely fresh mozzarella! Yum! TheChambrayCountess, so true! Each time I make the Polish pierogi, I ALWAYS think about my grandma:) Thanks so for the sweet reminder. I can't explain how much I want this sandwich right now. I have so been craving my fav' caprese lately. oh my gosh that looks amazing. I love pesto so much and this sandwich makes me think of a summer picnic! oh my that looks so refreshing and tasty!!! oh my goodness, this looks so yummy! i definitely associate food with memories. but even more than that, a specific scent can take me back to a memory in an instant. God, one of my favorite sandwiches! Looks yummy! I was reading frantically saying "OMG OMG OMG Pesto!!!" This looks SOOOO good! This looks like my recent sammy obsession. SO yum! Agreed! Sometimes all I need is a cheese and a veggie!!! And I'm set. So good! I wish that was my lunch today! Oh boy! Roast potato with popovers and gravy sound so delicious, Jeanette! That is my go-to sandwich! If caprese is on the menu I order it! yum!! Mmmmm! I'm so having this one day soon! Thanks for the inspiration!! Yummy wow that mozzarella looks fresh. Thank you sooooo much for featuring my favorite sandwich on your blog, Diana! And what a wonderful blog it is! I'm so glad I found you! this is indeed, the most perfect sandwich. Put that on a panini press and YUM!! !